Have Elvis marry you or renew your vows in Las Vegas at The Little Vegas Chapel! 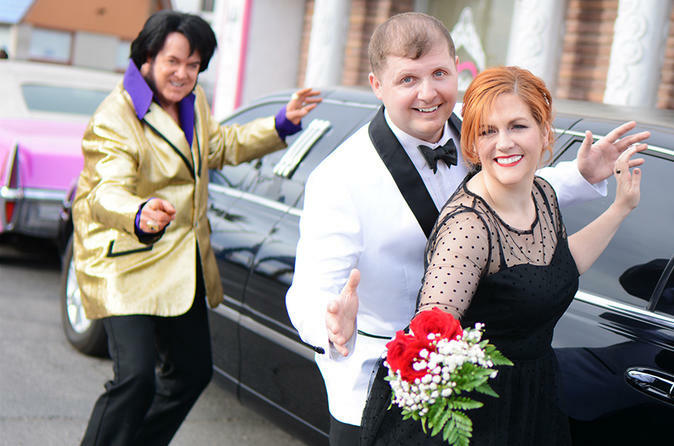 Begin your wedding service with a limousine ride from your hotel to the chapel, exchange nuptials with an amazing Elvis Tribute Artist, pose for photographs and enjoy your ride back to your hotel. Floral arrangement and video recording of ceremony included. Your special day begins with a limousine pick up from your hotel and drop off at the wedding chapel. While at the wedding chapel, your photographer will take posed photos in front of a Las Vegas Sign replica and in the chapel's photo studio. There are also props available to use in your photos. Next, you'll meet "The King" before the ceremony begins. Elvis will serenade you with one of his famous hits as the bride walks down the aisle. Elvis will officiate the ceremony and has a special set of Elvis vows for you to exchange. After saying "I Do! ', Elvis will sing you another song to celebrate! Afterwards, you'll return to your hotel by limousine to continue the celebration!